Meet Ann Walters, The Den's Guest Author for the summer! Ann Walters lives in the Pacific Northwest where she revels in rain, mountains, beaches, forests, rivers, and words. Her fiction has been published in Crow Toes Quarterly, wigleaf, Rumble, SmokeLong Quarterly, and Quarter After Eight, among others. 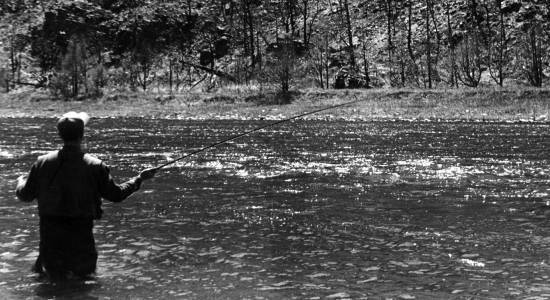 Jeremiah Glass stood thigh-deep in the water and watched his line slide downstream. The current was quick here and he found himself casting frequently, the Woolly Bugger floating over his head and back onto the river’s surface in smooth, fluid motions. This late in October the air had a bite to it. Even at noon, patches of frost still whitened the ground beneath the trees where he’d parked his truck. Jeremiah had shivered in the shade as he gathered his gear but out here in the middle of the river the sun reflected warmly off stone and water. He stretched his arms to take in as much heat as he could. The fishing line sang through the guides. It was so quiet in the canyon, Jeremiah could almost hear an echo from wall to wall each time he shook a few false casts to dry the fly. He wasn’t expecting to catch much today. He wasn’t here for fish, anyway. It was the river’s flow that had pulled him out of bed before dawn, his own familiar rhythm that had lured him over rutted dirt roads to this distant spot. Jeremiah felt the line go taut with a hit, then slacken almost immediately. He cursed himself as he cranked the handle of the reel and checked to make sure the fly was still attached securely. He wasn’t used to losing his focus on the river. Setting the rod carefully upright against a tree, he walked to the truck. His old rubber waders squelched with every step, but the thick felt soles absorbed the thud of his footsteps. Leaning against the open tailgate, Jeremiah drank coffee straight from his thermos and tried not to think. It didn’t work. He couldn’t keep his eyes from tracing the maze of scratches on the truck’s bed, but he kept his fingers wrapped tightly around his drink. It was hard to believe he’d had this truck for almost forty years. Even with the tailgate down, Jeremiah knew exactly where a worn tail of string hung beneath the bumper. It had been there for decades, waiting for Margaret McDonald to say yes. Waiting for tin cans that never came. They never would. He set his thermos back in the cab, next to a paper folded open to the obituaries, and moved back toward the river before his fingers had a chance to stiffen from the cold.